The Niigaan Coalition has received many requests for ways to get more involved here in Odawa. We really feel your energy and enthusiasm for recreating relationships here on Turtle Island. We are very excited to announce the first Niigaan workshop series examining Treaties. Gallery 101, 301 Bank St. The exercise uses blankets to represent the lands of what is now Canada, and the distinct cultures and nations which live on those lands to this day. Participants represent the First Peoples; when they step onto the blanket, they are taken back in time to the arrival of Europeans. Two participants are selected to play the roles of the Narrator and a European while the exercise goes through the history of treaty-making, colonization and resistance that resulted in the nation we today call Canada. This workshop will be led by Ed Bianchi of KAIROS. The workshop will be followed by discussion to ensure deeper understanding. Invited guests will be present to contribute their perspectives. For more information or to register, please email niigaan@gmail.com, or call 613-868-6983. 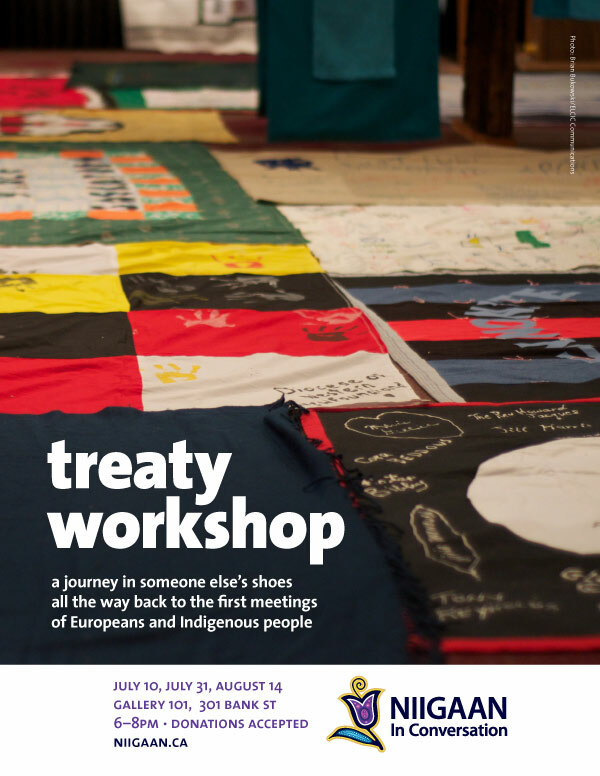 This entry was posted in Events & Workshops, Treaty Workshop and tagged blanket exercise, Canada, colonization, decolonization, Ed Bianchi, history, Indigenous, KAIROS, peace, relationship, resistance, Settler, Treaty, understanding. Bookmark the permalink. “We are very excited to announce the first Niigaan workshop series examining Treaties. but the poster and Facebook page say “July 10, July 31, August 14”. Just don’t want people to get confused and not attend! We just wrapped up our summer workshops series last night, and updated the text to match! There is no workshop on the 31, thanks for noticing!